(TibetanReview.net, Jan30’19) – The 30th death anniversary of the 10th Panchen Lama Choekyi Gyaltsen, Tibet’s second most influential religious figure, was marked at a Tibetan Buddhist monastery in northern India as well as by the Chinese in Beijing on Jan 26 and 28 respectively. The late Panchen Lama was co-opted by China in its annexation of Tibet but later suffered torture, including violent public show trials, and a 13-year imprisonment for submitting a petition calling for an end to the widespread savage ill-treatment of Tibetan people by the Chinese government. He was eventually rehabilitated but died at the relatively young age of 51 on Jan 29, 1989. In India, the commemoration was held at the Tashi Khel Monastery, Dhondupling Tibetan settlement in Clement Town, located in Dehradun district of Uttarakhand state. The event was organized by the settlement’s Domey Association and those who attended it included the Central Tibetan Administration’s minister for culture and religion, Kalon Karma Gelek Yuthok, and the Speaker of the Tibetan Parliament in Exile, Mr Pema Jungney. Several prominent Tibetan religious figures also attended the event. The Sakya Gongma Trizin, who was the chief guest, expressed gratitude to the late Panchen Lama for his help in the rebuilding of the monastic institutions of all the schools of Tibetan Buddhism, including that of Sakya, after they were completely destroyed by China. He has also lauded the 10th Panchen Lama for his enormous efforts in the preservation of the Tibetan language, religion and the protection of Tibet’s fragile natural environment. Special guest Pema Jungney has said the 10th Panchen Rinpoche had worked tirelessly on both religious and political affairs of Tibet under the repressive policy of China. 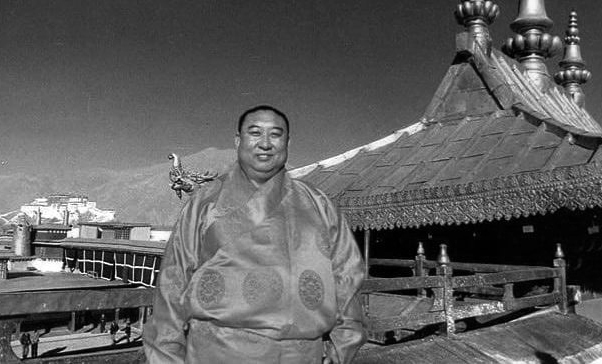 Kalon Yuthok Karma Gelek has also lauded the 10th Panchen Lama’s outstanding contribution to the preservation of Tibet’s unique cultural heritage, language and religion. In Beijing, three separate commemorative activities were held at the Guangji Temple, the Yonghegong Lamasery, and the Xihuang Monastery, presided over by the Chinese government-appointed 11th Panchen Lama Gyaltsen Norbu, reported China’s online Tibet news service eng.tibet.cn Jan 28. The report noted that the 10th Panchen Lama had died of a heart attack due to overwork during a travel to the Tashilhunpo Monastery in Shigatse, Tibet. Tashilhunpo is the traditional residence of the Panchen Lamas. However, under China’s rule, he was required to live in Beijing, as is the case with his Chinese government-appointed successor. There is still no news about Gedhun Chokeyi Nyima, the 11th Panchen Lama recognized and proclaimed by the Dalai Lama in 1995 but who was then kidnapped and disappeared by the Chinese government. The report called the 10th Panchen Lama “a great patriot, a famous state activist, a loyal friend of the Communist Party of China, and an outstanding leader of Tibetan Buddhism in China”. Another eng.tibet.cn report said Jan 29 that a symposium on the 10th Panchen Lama’s patriotic thought was held at the China Tibetology Research Center in Beijing on Jan 28. It was stated to have been presided over by Dradul, director-general of the China Tibetology Research Center. Sita from the United Front Work Department of CPC Central Committee; Yan Jue, a vice president of the Chinese Buddhist Association; the Chinese-appointed 11th Panchen Lama; and Huba Dengdai, a vice president of the Chinese Buddhist Association, were stated to be among the speakers. Thutop Sengge, vice president of the High-level Tibetan Buddhism College of China, Professor Palpal Dorje of the Minzu University of China, Zhang Yun, a researcher at the China Tibetology Research Center, and Gongbo Yugyel, a senior translator with the China National Radio were also reported to have spoken at the event. The report said more than 100 people including experts and scholars, representatives from Buddhist field, and relatives of the 10th Panchen Lama attended the symposium. Earlier, on Dec 28, a prayer ceremony was held to mark the 30th death anniversary of the 10th Panchen Lama at the Mahabodhi Temple in Bodh Gaya, Bihar, attended by thousands of devotees. In a five-minute video message for the occasion, the Dalai Lama called the late 10th Panchen Rinpoche an extraordinary spiritual figure who not only served the Buddha dharma but also worked tirelessly for the happiness and well-being of the people of Tibet. “Rinpoche’s devotion and service towards the Tibetan people and religion remained intact despite facing hardships for many years. Had he lived longer, I am certain that it would have been truly beneficial,” he has said. He was also reported to have said in a hundustantimes.com interview report on Dec 25 that the 11th Panchen Lama Gedhun Choekyi Nyima recognized by him was alive. The Panchen Lama reincarnation was instituted by the 5th Dalai Lama in the 17th century by according the recognition to his teacher Lobsang Choekyi Gyaltsen, the then abbot of Tashilhunpo Monastery.